The recent death penalty cases of Sakineh Mohammadi Ashtiani in Iran and Teresa Lewis in the United States have captured the world’s attention and focused it on the brutality and injustice of the death penalty wherever it is practiced. In recognition of the World Day against the Death Penalty on Sunday October 10, Mission Free Iran is coordinating a demonstration in front of the US Supreme Court at 2pm to condemn executions in the United States, in Iran, and around the world wherever state-sponsored murder is practiced. Washington, D.C. October 7, 2010 – The recent death penalty cases of Sakineh Mohammadi Ashtiani in Iran and Teresa Lewis in the United States have captured the world’s attention and focused it on the brutality and injustice of the death penalty wherever it is practiced. 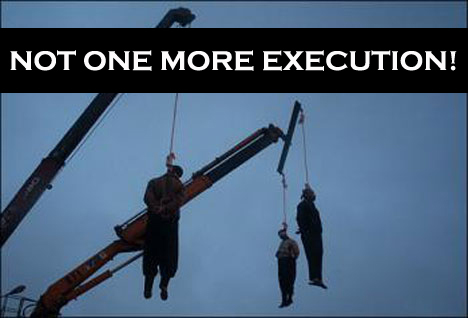 Execution by the state is pervasive in Iran, which executes more people per capita than any other country in the world, and in China, which executes more than 1000 people each year. The practice of state-sponsored murder in the United States, which ranks 5th in the world in terms of the number of people executed in 2009, is no less reprehensible and unacceptable in a modern and civilized society. In recognition of the World Day against the Death Penalty on Sunday October 10, Mission Free Iran is coordinating a demonstration in front of the US Supreme Court at 2pm to condemn and call for an end to executions in the United States, in Iran, and in every country that state-sponsored murder is practiced. Mission Free Iran opposes execution in all its forms. As one of the leading organizations in the international campaign against Sakineh Ashtiani’s stoning execution, we consider our involvement in the fight against stoning – one of the most savage ways of killing a human being – a victory and a step towards the greater victory of abolishing all forms of execution, not only in Iran but all over the world.